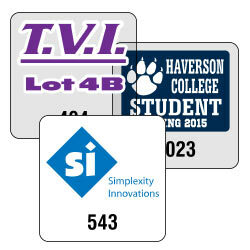 Our white vinyl parking permits are perfect for those who wish to have their parking validation located outside the car in places such as bumpers. 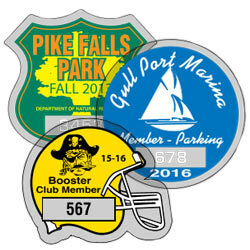 The strong adhesive will last through the harshest weather, keeping your parking in order. 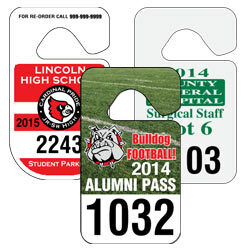 These parking permits are screen printed and come in 2 styles white vinyl or white reflective. Both styles have adhesive on the back and are suitable for outdoor use. 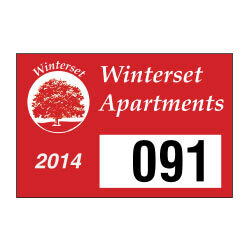 Numbering is included, and printed in either black or white. The numbers are approximately 7/32" tall. 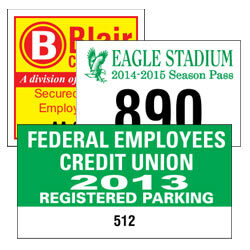 Small parking permits are 3" x 2" and Medium is 4 1/4" x 2 1/4". 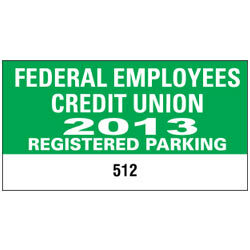 Large parking permits are 4 3/4" x 2 3/4"
Your choice of any of our standard colors for imprint. Copy Changes are available. Size and colors must remain the same on the entire order. Each change must be in multiples of 125. 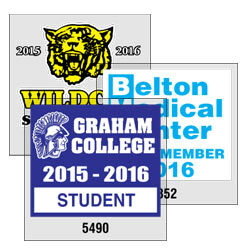 For color matching or copy changes contact a customer service representative.